Perfect for a dslr form type camera. Hope someone makes something like this. Last edited by ricardo marty on Fri Dec 28, 2018 5:00 pm, edited 1 time in total. It looks good but you cant open the eypiecs to look at the monitor. ricardo marty wrote: It looks good but you cant open the eypiecs to look at the monitor. Sadly, it's not available. This is an example of an accessory EVF produced by a number of manufacturers for their mirrorless cameras. It typically slides into the camera hot shoe and is powered by the hot shoe. It has a hinge so that you can change the angle of the eyepiece for low level shots. I don't think it would be altogether difficult to make such a device that connected via HDMI and was maybe powered by a small battery. There's no need to look at the monitor, as this would be an ancillary EVF, such as when conditions are very bright. You would be better off using a Leica type optical viewfinder on the camera than this hard to look through that low res EVF shown What is needed is a Zacuto Gratical Eye or Wooden Camera Mod of the BM EVF that can be powered from its own battery or from the camera, and have a HDMI input instead of SDI. That would be a class A EVF. Last edited by Denny Smith on Fri Dec 28, 2018 5:55 am, edited 1 time in total. Denny Smith wrote: You would be better off using a Leica type optical viewfinder on the camera than this hard to look through, low res EVF. What is needed is a Zacuto Gratical Eye or Wooden Camera Mod of the BM EVF that can be powered from its own battery or from the camera, and have a HDMI input instead of SDI. That would be a class A EVF. Not so, the quality and resolution of these EVFs has improved significantly over the years and even higher resolutions ones (5.6MP) are now becoming available (what do you think mirrorless cameras use?). This sort of EVF is far better than having a magnifying glass looking at an LCD screen. The versatility of such an EVF woudl significantly exceed the Zacuto style R+EVF that's bulky, heavy and power hungry. And let's not forget the much lower costs involved. And how would you use an OVF on a camera installed in a rig? The sort of EVF I described could be placed on the cold shoe of any BM camera, on an articulated arm or, as I mentioned, even held in your hand. If you've ever used one of these, you'd appreciate exactly how good they can be in actual use. Ray, yes you are correct, the new current EVFs found on a GH5/S or Nikon Z is great. I was kind of being “tongue in cheek” here, as was saying the optical viewfinder was better than the 5+ year old removable EFV you have shown, not rhe new ones available now. I had a Nikon V3 with a similar removable EVF, it was not very good either, compared to what we have now. Yes it would be grand for BM to develop some type of new smaller EVF for the Pocket 4K, like a scaled down Ursa Mini EVF with a HDMI connection, and a way to outer it fri the camera or Battery on the EVF. Their is no hot shoe in the Pocket 4K, so this type of connection for power and signal feed is out. Perhaps the USBC connection can provide an alternative connection point for power and signal? Ray, if you get a chance, you should check out the BM Ursa Mini EVF, it is one of the best I have used, and I have tried quite a few. I did the Wooden Camera Mod to mine, which made it more useful on different cameras.p, as well as making it smaller, like the Gratical Eye, which is also a grand EVF. Denny Smith wrote: Ray, yes you are correct, the new current EVFs found on a GH5/S or Nikon Z is great. I was kind of being “tongue in cheek” here, as was saying the optical viewfinder was better than the 5+ year old removable EFV you have shown, not rhe new ones available now. I had a Nikon V3 with a similar removable EVF, it was not very good either, compared to what we have now. To be honest, even the VF-2, which is only 1.44 million 'dots' would be better than any field monitor in extremely bright conditions. The 2.34MP is excellent. You don't need a powered hot shoe for the concept I'm imagining, a cold shoe to hold the EVF would suffice. Obviously it would need to be slightly larger to accommodate the connections, but no where near as large as existing EVFs that use LCD screens. Basically, it would simply need a HDMI input and a power input. Both would be quite small, especially given that the existing input on the VF-2 is full HDMI sized.. 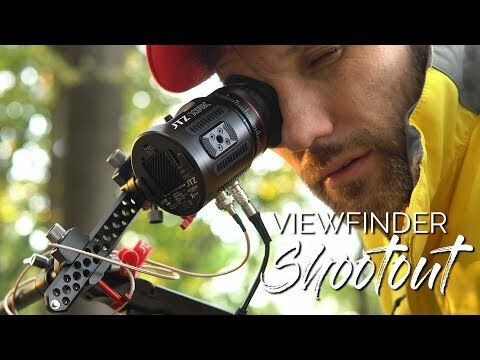 I'm aware of the Ursa Mini viewfinder, but it costs more than the BMPCC4K. Plus it needs an SDI input, further complicating things. And it's still overly complex and large for what is really needed. I really only want an EVF for times when conditions are really bright, the usual Australian summer. On the other hand, I could always fall back on what I used to do many years ago. Australian Image wrote: You don't need a powered hot shoe for the concept I'm imagining, a cold shoe to hold the EVF would suffice. Obviously it would need to be slightly larger to accommodate the connections, but no where near as large as existing EVFs that use LCD screens. Basically, it would simply need a HDMI input and a power input. Both would be quite small, especially given that the existing input on the VF-2 is full HDMI sized.. Yes, this is kind of mindboggling. 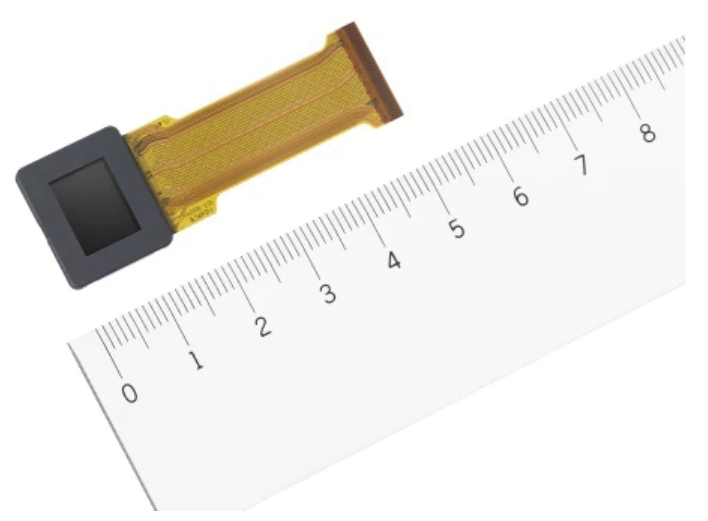 I expect a good marked for a HDMI connected EVF at this size. It seems like most vendors have become a bit lazy, relying on existing monitors 3.5”+ with magnifying glass rather than developing tiny EVF like the one you are mentioning Ray. If anyone know of such EVF. Please enlighten us ASAP! I do a lot of hiking with my gear and need small/light weight size. Big EVF/monitors is out of the question, especially now when I shot with the BMPCC4K. I know it was a joke, but the dark cloth answer (above) seems like the cheapest, easiest, most fool proof solution. Doesn't need a battery. No cable to fail. Fits in your pocket. You could blow your nose on it an emergency. I always carried one with my view cameras in the film days and it worked quite well (although it does muss up your hair). I also carried a small loupe to assist in focus, which I still have somewhere. I'm going to pull out both next sunny day and will report back. Spot on to you both. Ric, I still carry by view camera focus cloth in my kit, comes in very handy. Yes, a smaller more elegant EVF is needed for the new Pocket, but to get good EVF optics and screen resolution, it is going to cost more than $1K, unless someone gets very creative and figures out a way to get the price down, with potential volume sales. That said, this EVF would need to be more universal, and not camera specific. Denny Smith wrote: , but to get good EVF optics and screen resolution, it is going to cost more than $1K, unless someone gets very creative and figures out a way to get the price down, with potential volume sales. Yup. Hopefully the already existing EVF tech, used in today’s DSLR’s, are cheap enough to convert into affordable external solution. But it all depends on who will be first one to hit the marked. That will define the marked price for some time am afraid, regardless which technology. These EVFs for Olympus, Canon, Nikon, Ricoh etc are all available for around AU$250 or less, so it shouldn't be that big a leap to make a universal one that costs not much more. Epson are the main manufacturers of the EVF modules used in just about every mirrorless camera, so they aren't hard to source and would certainly not be hugely expensive. Epson started producing 4.4MP modules in 2015. That's twice the resolution of any current field monitor. Ray, I hear you! We should almost make a riot on this one. Oyvind Fiksdal wrote: Ray, I hear you! We should almost make a riot on this one. If I knew of a manufacturer in China that made such things I've been Googling), I'd contact them like I did Viltrox with the Bluetooth remote idea. I should have added that I did email the Feelworld contact in Australia, but never received any response. ricardo marty wrote: Perfect for a dslr form type camera. Hope someone makes something like this. That is exactly the EVF I'm using on the P4K. Works brilliantly. I would not be surprised if Zacuto either started manufacturing this again or came out with a revised version. Glad to see I'm not the only one lobbying for this kind of tiny EVF, which would be so perfect for the 4K ! Really hope someone gets to make one - I would, if I had the knowledge ! Ray, in the past both Tilta and Smallrig have stated that they are interested in hearing from and working with people with ideas. It could be worth a try contacting them. If only the Blackmagic Design community knew of a company that made electronic gear. Leon Benzakein wrote: Ray, in the past both Tilta and Smallrig have stated that they are interested in hearing from and working with people with ideas. Titla seems to be more on the expensive side and I've contacted SmallRig on other ideas and not received any response. Sooner or later someone will come up with a device, I just hope it's not another magnifier attached to an LCD screen. I hope that who ever develops it´s is thinking of the bmp4k. And wont price it above the cameras cost. That costs almost twice what I paid for my BMPCC4K. Well, in USA dollars, arm$1950, it is about $700 more than the camera sells for. But a good EVF (especially one with SDI and HDMI inputs) is like a good lens, itmeill outlive several cameras. I still have the original Zacuto ZFinder Pro EVF and it works with the Micro cameras, as long as you do not go past 30fps, so camera resolution advances without backwards HD support, is going to be the limiting factor for how long a EVF will be useable. Last edited by Denny Smith on Sat Jan 05, 2019 3:28 am, edited 1 time in total. I paid $1500 for my BMPCC4K, that EVF costs just under AU$2800 from Amazon. And when you look at the size of this EVF, it's massive. Both aspects defeat the purpose of such an EVF for the BMPCC4K. comparación video with this evf vs the zfinder and the spectra. According to the Amazon site, that EVF is bigger than an Australian 375mm can of Coke. That's 9x the size of the VF-2 EVF (I calculated the difference). And it's 10x the price of the Olympus VF-4 (same size as VF-2) that has a 2.34MP display. I just watched the video and the EVF is simply too complex (ie features) for what's needed for the BMPCC4K. All that's needed is an EVF that's small and just shows what the camera sees ie what's on the LCD. That's what the VF-4/VF-4 does and it's perfect. We really need something for the BMPCC4K. Blackmagic could do it. The wooden camera mod proved it. I would buy one. Ray, the main difference is eye relief and viewing comfort when you use a EVF for 8-10 hr day, looking through it for 15-30min at a time. Also having Waveform and Vector Scope displays is a very useful tool. Yes, having a basic EFV that displays the Pocket Camera output is needed, but it needs to be big enough to use easily, and look through withmiut getting eyen strain. The Zacuto Gratical Eye and the JTZ Kameleon are about as small as they currently get. Out of the lot, the Eye would be my first choice if it had a HDMI input also, but it doesn’t and I managed to get a BM Ursa Mini EVF for 900, and did the Wooden Camera Mod, so is is about the same size as the Eye, only a different shape. The VF-2/4 may work for you, but it is not what everyone else is looking for. Once you use a good EVF like these, you will not want to go back to still camera style EVFs. What I'm suggesting is not for 8-10 hours of use, but for times when the sun glare is too intense for effective use of a field monitor and you want more accurate focus. The VF-4 is ostensibly the same as in a mirrorless camera, which one can use quite comfortably and easily, without any eye strain. Photographers have been peering through OVFs and EVFs for years. As a sports photographer this was bread and butter for me. I'm not suggesting that something like the VF-4 is for everyone, but I'll bet my left nut that a very significant number of users, especially those with a minimal setup would jump at the chance to use one with their BMPCC4K attached to the top of the camera. The evidence is already there with the numerous YouTube complaints about lack of an EVF and supporting comments attached to those videos. The BMPCC4K is a completely new style of camera (though following along the lines of the BMPCC which had the same issue), so there needs to be a bit more thinking outside the square, especially with regard to the intended users. Rejecting ideas from those relatively new to cinematography isn't helping anyone. I don't believe that the BMPCC4K needs a built-in EVF, but I strongly believe that a small, flexible to use, EVF similar to the VF-4 would be of huge benefit to many people. It might ay well be Ray, and it is good to always have choices. At the very least it could just give me the image and a loop. Thats all i need for the bmp4k. ricardo marty wrote: At the very least it could just give me the image and a loop. Thats all i need for the bmp4k. I think that's all anyone wants with such an EVF and you can get the likes of the VF-4 for Olympus, Canon, Nikon, Sony, Ricoh and even Leica; cameras that are designed with just an LCD but allow you to attach an external EVF. All of these are designed to show what the LCD shows and are small and lightweight. The technology is fully established and the components readily available, as is the technology behind HDMI. I don't think there'd be all that much involved in replicating such an EVF with a HDMI input. Such an EVF would be useful not just for the BMPCC4K, but also for DSLR/mirrorless cameras attached to rigs where the user occasionally wants to use an EVF but the camera's EVF is inaccessible. Yes, but the main issue is, the Olympus and cameras like it that have an optional external EVF have part of the EVF video processor circuit inside the camera, and the hot shoe connection feeds the display power and the pre-processed signal, via a multi pin connection. The Panasonic EVA does this, but added a larger EVF/display. The Pocket 4K does not have this option, and the EVF must contain the video processor to turn the HDMI signal into a useable display, and yiu need to add external power from some source. And no, not “Everyone/Anyone” wants just a small EVF, dome of us want a more useable display and additional features in the EVF. As good as the screen is I would prefer a 5" loupe that wasn't $250. The only one I can find at the moment costs $250 which is absurd for what it is. Denny Smith wrote: Yes, but the main issue is, the Olympus and cameras like it that have an optional external EVF have part of the EVF video processor circuit inside the camera, and the hot shoe connection feeds the display power and the pre-processed signal, via a multi pin connection. The Panasonic EVA does this, but added a larger EVF/display. I'm not sure why you keep insisting that no one can produce an EVF that's significantly smaller, practical and usable. Why is it possible to produce a $60 4K action cam with an LCD screen, plus video outputs, that's barely bigger than the VF-2 (I have both), yet it's impossible to build an EVF that's around the same size? I also don't understand why you keep insisting that bugger all users would want such an EVF and that such an EVF would ostensibly be unusable. The fact that people are discussing this issue in many places on the internet is evidence enough that it is a desired product. People are using such EVFs with their mirrorless cameras all the time and find them extremely usable, practical and desirable. And here's an example of a clever person making their own: https://www.instructables.com/id/Electr ... l-Cameras/. Last edited by Australian Image on Sat Jan 05, 2019 10:42 pm, edited 2 times in total. dsorbera wrote: As good as the screen is I would prefer a 5" loupe that wasn't $250. The only one I can find at the moment costs $250 which is absurd for what it is. I bought a 3" Hoodman loupe for my early mirrorless cameras ,before EVFs became available, and it's bloody awful. I decided then and there not to buy another mirrorless camera until EVFs became available. I tried the Hoodman on my field monitor to see how it would fare and it's horrible. I really like using the field monitor I have, but there are times when an EVF would be very handy. I would certainly not be using the EVF for possibly more than 10% of the time, so buying any current EVF at the prices demanded is out of the question. And the issues with size and power draw don't attract me one bit. Ray, I did not say, “I also don't understand why you keep insisting that bugger all users would want such an EVF and that such an EVF would ostensibly be unusable”. I only said it was not an EVF that everyone would want, as you had implied. If you want a small EVF, fine go get one. I was just pointing out the current small EVFs that you have referred to, had to depend on additional processors built into the cameras that use them. If BM or someone else can delvleop and market a small EVF under $900, then great. I bought a 3" Hoodman loupe for my early mirrorless cameras ,before EVFs became available, and it's bloody awful. I decided then and there not to buy another mirrorless camera until EVFs became available. I came to the same conclusion after using the Zacuto ProFinder which has better optics than the Hoodman, put it on the original Pocket camera, with its low res screen, it was not easy to use either. So without a good useable EVF, I passed on the new Pocket 4K, and canceled my pre order because I could see adding an external EVF from what was available was a non starter, without getting overly complicated or too expensive. I picked up one of the new Nikon Z6 Cameras I stead, it has an excellent EVF that got very good reviews. That said, it is one of the best in camera EVFs I have tried, but as good as it is, I do not see trying to use it more than for a few minutes, not an EVF I would want to try and use for a long video take. Same goes for the EVF on my Olympus PenF. But that is just me and how I use an EVF for shooting video. For still photos these two EVFs are great. And this is a wrap. Last edited by Denny Smith on Sun Jan 06, 2019 12:11 am, edited 2 times in total. Denny Smith wrote: Ray, I did not say, “I also don't understand why you keep insisting that bugger all users would want such an EVF and that such an EVF would ostensibly be unusable”. I only said it was not an EVF that everyone would want, as you had implied. If you want a small EVF, fine go get one. I was just pointing out the current small EVFs that you have referred to, had to depend on additional processors built into the cameras that use them. If BM or someone else can delvleop and market a small EVF under $900, then great. By the same token, where have I said that 'everyone' wants what I and some others are seeking? And you have implied that such an EVF would be ostensibly unusable '...when you use a EVF for 8-10 hr day,..'. Again, I have never said that should be its intended use. I have no idea why you're even posting here arguing about something that you don't need or want and dissing any discussion about ideas and possibilities for a product that others do need and want. I am not dissing any part of your discussion, but just trying to offer an additional viewpoint, not engage you in an argument, which you are trying to do. Denny Smith wrote: I am not dissing any part of your discussion, but just trying to offer an additional viewpoint, not engage you in an argument, which you are trying to do. Your additional viewpoint is that you don't like the idea of such a product, don't need such a product and don't want such a product. It's all negative. We understand that it's not for you, but that's not an additional viewpoint adding value to a discussion on how such an idea could be made into reality. There are already a multitude of EVFs available that would do the task, but they are all expensive, large, power hungry and especially not suited to those who would like to hand hold a minimal setup. Agreed, and this is why I passed on the Pocket 4K. Same issue with the Micro Cinema camera which I also sold. Thought someone would release a smaller (than the current lot) EVF that could be easier to use on the Micro camera, but so far that has not happened. If BMD, or some one else, comes up with a good EFV like the Ursa Mini EVF (Head only, not the crazy bracket) or Zacuto Eye, but with HDMI input and under $950, then I would jump on that one and order the new Pocket 4K, which seems to be an excellent video camera. See Ray, I am not dissing what you are saying. Last edited by Denny Smith on Sun Jan 06, 2019 2:32 am, edited 1 time in total. Maybe just a bigger eyecup. Hope that you can check focus on this. If BM doesn't make it somebody else will. Hopefully. It needs to be a reasonable size, but not huge. The eyepiece doesn't need to be overly large and eyecups can be added to suit the user. As for size, given today's technology, I reckon that you could make something like this that was about the same size but perhaps twice as long. That would accommodate a power and a HDMI plug. Nice, but is the large enough for a full size HDMI A connector? Micro HDMI have been problematic in the past. A full-sized HDMI connector would be easy to fit, the connector on the VF-2/VF-4 is slightly smaller than a full-sized HDMI connector. To make an EVF of the absolute maximum size for this sort of application, it needn't be any larger than say two Canon LP-E6 batteries stacked together (to provide some sort of universal point of measurement). If someone can't make an EVF of that size or slightly smaller, they aren't trying. 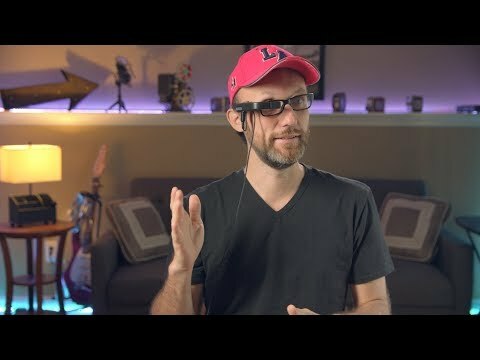 OK, here is another “way out” option, how about a very small HDMI to WiFi streaming box on the camera, and wear a pair of headsup display glasses (SVS) that would project the screen image in front of you, now you can place the camera where every you need it and see what the camera is doing. Would something like this work with an eye cup? Attache this to the camera instead of on glasses. This thread has become a Tom Antos love fest. There is a post on B&H about not working with BMD. Needs to be confirmed. Interesting, yes, this is one concept. A UHD/SVS, a larger image is floating in front of you, no little peep hole. But, something like this, is an option. Now if it will work with the BM Pocket 4K? I have sent an email to the company.